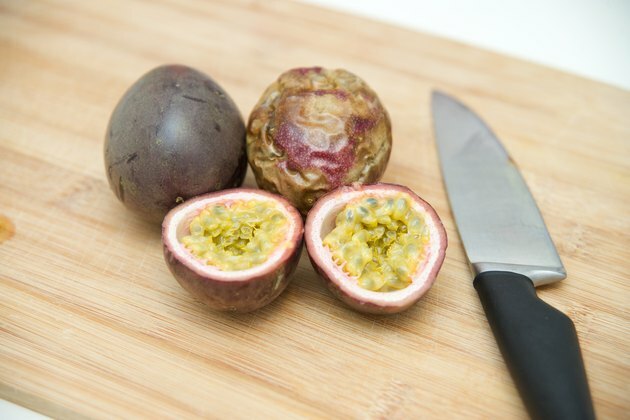 Passion fruit is high in fiber and vitamin C and is native to South America. It has a mildly sweet flavor that makes it great for eating plain, adding to salads or blending with other fruits. 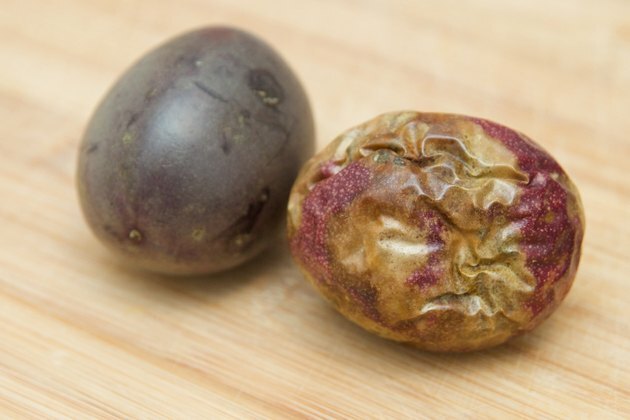 In the United States, the most commonly-available variety of passion fruit is round and purple in color. For the best flavor and texture, choose fruit that is ripe to slightly overripe. Purchase fruit with a smooth skin that is free of discoloration and bruises. 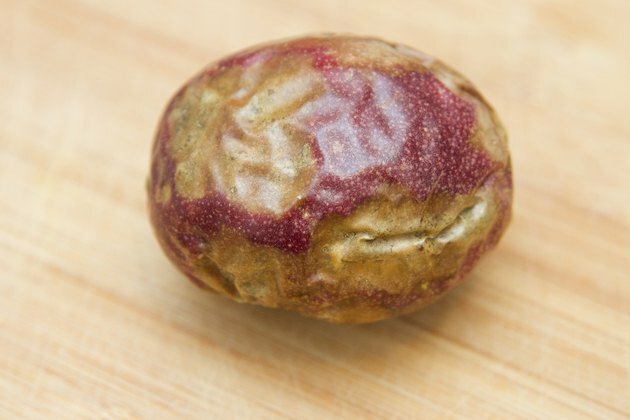 Wrinkled skin indicates that the fruit is older, but it still may be edible. Select fruit with a vibrant yellow, orange or purple color. Green indicates that the passion fruit is not yet ripe enough for eating, and green spots on the skin usually mean that the fruit will be less sweet and juicy. 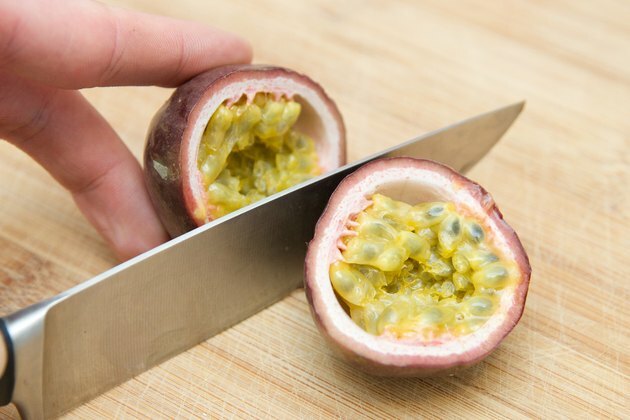 Cut passion fruit in half with a sharp knife and scoop out the fruit and seeds with a spoon to eat it plain. The seeds are crunchy and edible, but the membrane that separates the seeds from the peel is very tart. You may want to sprinkle sugar on the membrane before eating it. 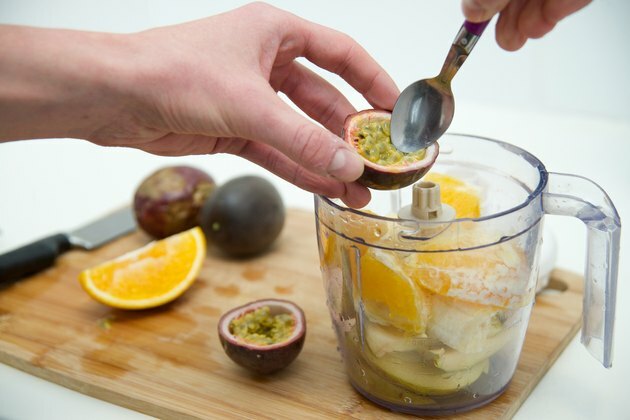 Mix the seeds and pulp of passion fruit with other fruits and vegetables, such as carrots, oranges, guava and lemon, in a blender. Add apple or another fruit juice until you reach the desired consistency, blend again, and then drink the mixture. Heat passion fruit if you want to eat it warm by scooping the seeds and pulp into a small saucepan and warming it slowly over low heat for several minutes. Mix it with cream and sugar when warmed and serve it in a bowl. 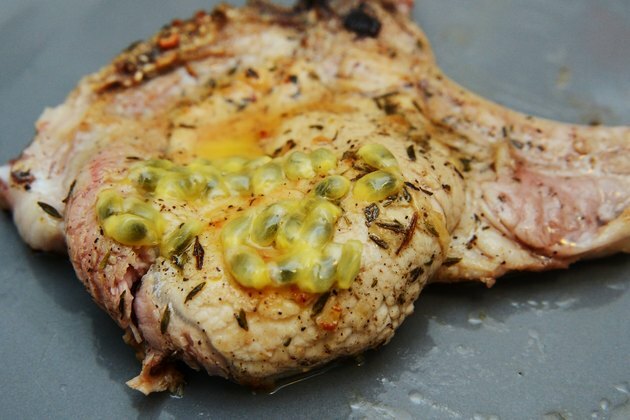 Use passion-fruit juice as a substitute for lemon juice when baking. 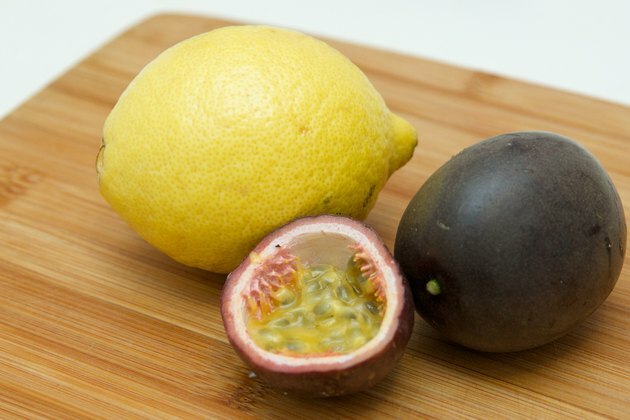 Both juices work well with the same foods, but passion fruit will add a bit of variety to your meals. 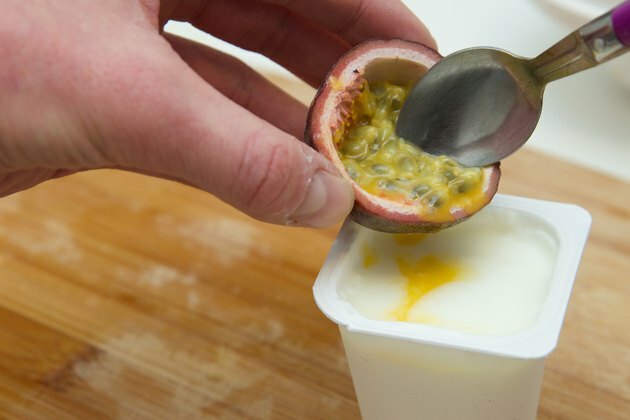 Serve mashed or sliced passion fruit with salads or ice cream, or cut it up and add it to yogurt. Add the fruit to sauces when cooking fish and pork. Use the juice or mash up the fruit and spoon it over your main course. 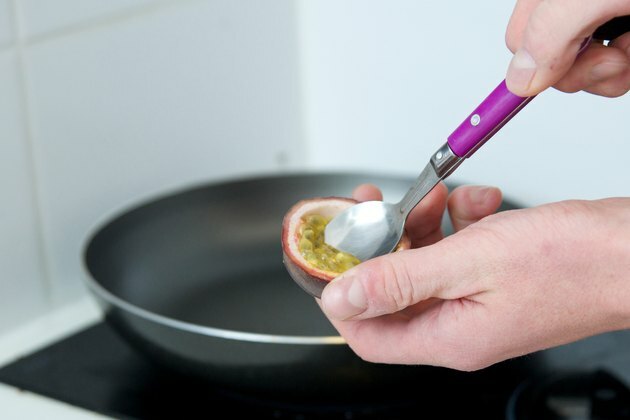 If you want to remove the tiny seeds from passion fruit, do so by pressing the fruit against a fine sieve. Microwaving the fruit for 30 seconds prior to doing this may be beneficial, as the seeds are easier to remove from the pulp when it is warm. My Family Doctor; Passion Fruit: Nutrition, Storage, How to Pick and Eat; Libby Mills, M.S., R.D., L.D.N.